If you ask my wife she’ll confirm that I really really dislike plumbing. Even when we lived in our bricks n sticks house plumbing matters were one of my least favorite chores to deal with. It’s not that I couldn’t do it myself…I had the tools and the basic knowledge, I just hated it. I did it because I didn’t want to pay the prices charged by a plumber or handyman. The other day we were preparing to depart the park we were staying in. Routine morning…everything was going fine. It was right after the wife took her shower and before I could get mine…she heard a bang followed by the sound of running water coming from the shower. Nothing was visible but it was obvious from the sounds water was pouring somewhere behind the shower surround. I turned off the water at the source…outside at the spigot. Did I mention it was raining outside…not just raining but pouring rain. Murphy was visiting us. I pulled the inspection panel at the base of the shower stall by removing the two screws that held it in place. Laying on the floor with a flashlight I peered under the shower…water was dripping down the wall between the shower surround and the exterior wall of the coach. Fortunately, someone designed this coach for such emergencies and the water quickly exited out the bottom of the floor thru the holding area where the holding tanks are. I removed the shower faucet to discover that the connector between the PEX pipe and the faucet had blown apart. Specifically the nylon fitting that threads onto the faucet split and came off. We had to get on down the road, so the repair would have to wait until I could source parts. Once we arrived at our next stop the two priorities were to source the repair part and grocery shop. It took three stops to find the part needed but a local RV/Marine place had just what I was after. Replacing the fitting required removal of the old one first. Here is where you need to either get the right tool or hire someone else to do the repair. I tried to remove the old fitting with a utility knife working through a 6 X 3 inch opening where the faucet was mounted. The knife slipped and…well it was painful and almost required a trip to the ER. I’ll have the scar to prove it for the rest of my life. This meant no running water that first night. Any water we needed we got from bottles or a pail filled at the spigot. This allowed us to flush the toilet and wash dishes. The next day I went out looking for the right tool and found one at a local builder supply store. A $20 tool just to make one cut. With the tool, the removal of the old fitting was a breeze. Now putting a PEX fitting onto PEX piping is hard enough. Doing through an opening in the shower surround that is 6 X 3 inches is even harder. As hard as I tried I just couldn’t get it onto the end of the pipe. This attempt also made more difficult by the injury sustained previously. Tried several times but couldn’t get it on. It being a Friday night, hiring someone to come out wasn’t an option. No sense paying for an emergency call on a weekend…we’d just use the parks showers until I got the fitting on or Monday which ever came first. After several more attempts on Sunday, I gave it one last try Sunday evening. I put some dish soap on the fitting and pressed it as firmly as I could to get the fitting to slip into the PEX pipe. Success! It went on and was on securely. So I hooked up the faucet, then turned on the water pump to pressurize the system. It held! I left it to remain overnight to check for leaking…if the pump came on other than when we were flushing or otherwise using water I would know there was a leak somewhere. The next day I switched over to park water to supply the coach and all was good. Until later after we showered we heard dripping again from behind the shower. 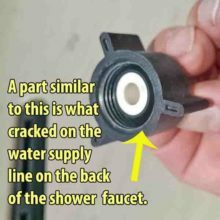 Seems the gasket inside the fitting was in backwards…repeated the process and as of this post the shower is back in service and the problem appears to have been resolved. I do have an extra fitting just in case another fitting somewhere decides to do what the shower did.